Many people visiting Bali with different purposes. There are some people who want to come to Bali for business, and there are people who just want to enjoy all the things that Bali has, especially for its famous attractions. The places like Kuta beach, Pandawa beach, and the well known Great GWK Statue are the examples of them. But, beside visiting the famous locations in Bali, there’s one goal that many people interested for doing it, the culinary journey. 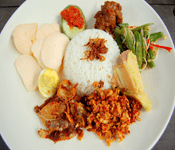 Exploring the varieties of Balinese cuisines is one of the best things that people can get when visiting Bali. 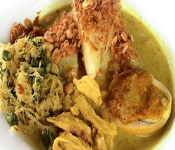 Balinese foods are considered the best around the world, especially the Chicken Betutu that many people know. Beside Chicken Betutu, there are hundreds of them still unexplored. 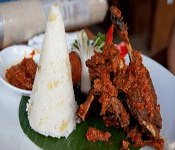 So, we trying to help you here by providing the list of popular foods to eat in Bali. 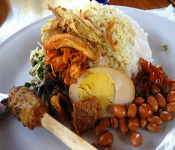 The first food in the list is the Tekor Rice. This rice is not an ordinary rice you can find in many places. Tekor Rice is pretty unqie because the original one is cooked with a very special method. The things you can find inside the Tekor Rice are also very delicious. Named Tekor Rice because of the usage of the traditional leaf plate, which is used by the locals at the the old age. 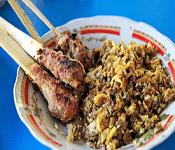 If you want try to eat one, you can go to the area of East Denpasar, and see the Warung Tekor that sells this cuisine. 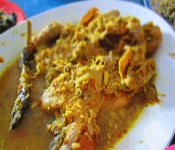 Of course anyone who already visited Bali is not so strange anymore with this special dish of Bali. Chicken Betutu is this spicy chicken. But not the ordinary spicy chicken, it’s so special because of the additional spices that added into it. The method of cooking Chicken Betutu is a little bit complex. But the most important thing is to get the spices first and then just combine together and put them inside the chicken. Cook the chicken that covered with banana leaf with charcoal for about 24 hours to get the best taste. Next one is Nasi Campur or Mixed Rice. 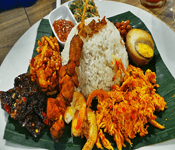 Nasi Campur on Indonesia is basically filled with so many stuff, that putted together on the rice. That’s why Nasi Campur is actully doesn’t have the exact taste because of those additional elements. The fact is, this Nasi Campur is actually used for breakfast each day by some Balinese. Usually in some restaurants or stalls, the side dish that combined with this Nasi Camput is really different. But, altogether can be better if there’s a Sambal Matah. We talked about the mixed rice above, then we switch into the chicken rice in Bali. This dish is actually really famous in the area of Ubud Bali, with its famous restaurant that located on the Kadewatan street. Beside having the perfect view of eating, a nice view of a natural ecosystem where there’s a mountain and rice fields everywhere, the main point to come here is of course to try a plate of the chicken rice. One portion of chicken rice will be completed with lilit satay, egg, chicken sisit, fried chicken, and also lawar. Anyone who is coming to Nusa Dua area will be hipnotised with the attractions in there, especially for the beach attractions. The beaches there are realy suitable for basically every person on earth who has different hobby. They can either swim, snorkeling or surfing, they can pick whatever they like. But they may miss the favorite dish in that area, the Bengil Duck. A pioneer of a crispy duck in Bali. Bebek bengil is actually the name of the restaurant who sells many kinds of duck meals, including Sambal Ijo Duck, and Nasi Campur. Unlike the usual satay in Indonesia, the wa to serve the Sate Lilit is a little bit different. On the usual satay, the meat will be pierced through a bamboo stick. But in Sate Lilit, the meat should be processed first into a mince meat. And then, the meat can be sticked up to the wooden stick, and then burned up on the charcoal. Beside the wooden stick, sometimes lemongrass is also used as an alternative to create better smell. 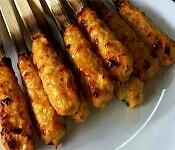 The most famous Sate Lilit in Bali is the one that used mackerel fish meat. Lawar Kuwir is basically like a salad in Bali. But, this salad is combined with the mixed of other meats. The popular one is Lawar Kuwir that used pork meat. The minced pork meat then combined with the vegetables that preserved before. But muslims shouldn’t be worry about this, because there’s an option of Lawa Kuwir that they can consume. The alternative is using entog or duck meat instead. And the process of making it is just the same with the ordinary Lawar Kuwir. There are two famous Rujak in Bali, the first one is this Kuah Pindah and the second one os Rujak Bulung. Rujak Kuah Pindah is totally different than the other Rujak in Indonesia like Rujak Cingur for example. This Rujak uses the Kuah Pindah, the soup that made out of fish meat. The taste is pretty good, especially if you combine it with some spicy stuff like hot spicy chilli. 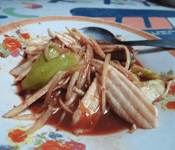 Usually Rujak Kuah Pindah also use the same materials as usual Rujak like fruits or vegetables. Next one is Rujak Bulung. This kind of Rujak is totally different from othe Rujak, including Kuah Pindah above. If they use the fruits as the main ingredients, Rujak Bulung uses sea weed. But the sea weed that used in this Rujak is also very special. It’s called Bulung Boni. 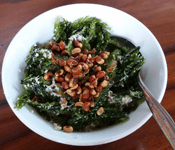 The Boni seaweed is the thick sea weed that always used in this Rujak Bulung. With very high fiber that very useful as a tool to detox the body with its high level of clorofil. Rujak Bulung ain’t complete without the additional burned coconut that will added on top of it. Next one is Serombotan. 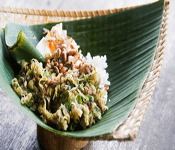 This food is fairly identical with the Javanese traditional meal, Urap-urap. So, you can say that Serombotan is Balinese version of that. Inside the Serombotan, you can find some vegetables like spinach, beach, momordica, etc. And Serombotan also uses this special spice called Kalas. Kalas is made out of some important spices like onions, coriander, garlic, and tumeric. That Kalas is also combined once more with either peanut sauce or spicy sauce. In Bali, there are two kinds of Tipat, Tipat Cantok and this Tipat Blayag. Tipat Cantok uses the peanut sauce as its additional ingredient, while this Tipat Blayag uses the combined sauce between rice flour and other Balinese spice. But both of them are basically the same in the form of Tipat. It looks like a lontong more than a ketupat. The texture of the spice that used in this Tipat Blayag is more thicker. It’s very good especially when combined with the other stuff like kerupuk or Urab vegetables. For the tourists that happen to have a low budget for eating, the Jinggo Rice can be a perfect choice for them. Sold in a very affordable price, Jinggo rice can fulfill the hunger with the stuff it has. One portion of Jinggo rice has a complete set that consists of rice, chicken meats, tempe, and also super spicy sambal. One little portion is maybe not enoguh, so ordering two or three is maybe suitable. The cost for one Jinggor Rice is only for Rp3.000,- rupiah. With the hand size meal, this can be perfectly well for most people in Bali. 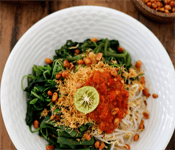 Aside from the thirteen kinds of popular foods to eat in Bali above, we also want to provide you with the other list that contains the rest of cuisines to complete our topic for today. So here it is, another list of Balinese popular foods. So our topic for today, the popular foods to eat in Bali ends here. All of them are great to try and very recommended, especially for the people who haven’t tried them yet. They are coming with such a great taste and also very affordable price. Unlike the other developed countries in the world, you can get most of the foods listed above just by buying them from the street vendords. And of course the price wil be much better if you buy them this way. But of course, some cuisines like Chicken Betutu or Kedewatan Chicken Rice will require you to visit some restaurant in Bali. You can even join the cooking class in there, where you can make your favorite dish yourself.